It's an election year and you can be sure that the issue of the business tax will be brought up at some point during the campaign. Katz himself raised the abolition of the tax a couple of elections ago but, along with free transit fares for seniors, was considered 'completed' after a few minor adjustments. 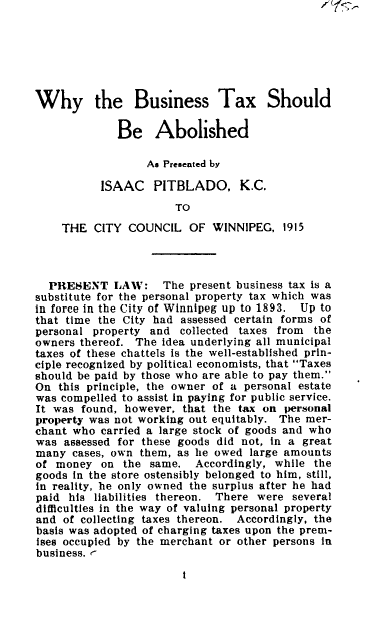 Here is an 11 page case put forth by Isaac Pitablado on behalf of the Winnipeg Branch of the Retail Merchants' Association of Canada as to why the business tax, introduced in the 1880's, is unfair to business. The date of the manifesto: 1915, though it could have been written in present day ! I plow through old newspapers all the time, and the most depressing part is how often the issues of tomorrow... are the issues of yesterday.